From the booklet "I AM ISHCOMAR - the voice from beyond our stars." Preface to the Ishcomar -contacts. Ishkomar was an extraterrestrial who began channeling or speaking for the first time in late September 1966, through a Phoenix man identified only as "Charles- a blue-collar worker of modest education" (Steiger, 1973). Ishkomar said he was speaking via telepathic light beamed from a spaceship in Earth's atmosphere. He himself had lived long enough so that he was able to discard a physical body, though the ship "contains others of us who are in human form." Ishkomar began his Earth mission some thirty thousand years ago to accelerate evolution so that human beings could develop more quickly and be able to accept guidance - though not control, which galactic law forbids-from wise space people like himself. "You must reach a high level of mental development and knowledge to be able to understand our purposes," he said, so the work continues. Ishkomar also warned that another group also worked in Earth's space. This group, while not necessarily evil in itself, had purposes at odds with humanity's best interests, and its members sought to control human destiny. Ishkomar refused to condemn these beings, saying only that their purpose "conflicts with our purpose. This does not mean that their intentions are not good or honorable." Soon there would be "great upheavals" on Earth's surface, and there would be much suffering and death. Only those who were mentally and physically prepared would survive. 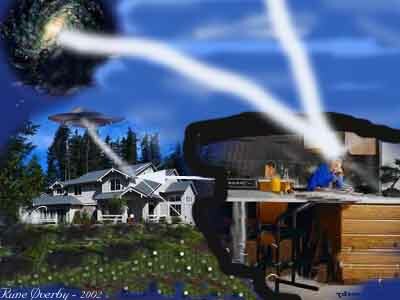 The extraterrestrials did not plan any massive rescue operation, since "you are of no use to us in the Outer Reaches." But they would help those human beings who heeded their words to make their planet improved and liveable after the changes. Ishkomar said his people were not concerned solely with Earth. They were galactic travellers and were involved with the fates of many worlds throughout the cosmos. Charles told Brad Steiger that he had no idea why he had been chosen, unless it was because of a sighting of what he took to be a UFO in Michigan in 1956. While observing the object, he beamed a mental message to its presumed occupants and told them, "I would like to be your friend." After the Ishkomar messages started coming a decade later, Charles and his wife, Lois, formed a small group. As Charles channeled, members asked questions and learned lessons. Ishkomar firmly instructed them never to reveal Charles's full name, lest his life be endangered by unfriendly forces. Preface of R.Ø. : this message came nearly 40 years ago - long before "the inflation" of channeled books emerged through the 90ths. The appearance of the message seems to be through a temporary "walk-in" or through a "technical-transfering" - or as they call it ":a tensor-vector beam.". Others would say a form of "technical" trancetalking, and the messages are quite interesting. The same method seems to have been used in a contact in South Africa - from KOLDAS - after the first pfysical contact and later RADIO-contact had been used. (link norwegian og engl.) You don't need to believe it - judge yourself! Wordmistakes may occur - as the text is scanned from this old booklet from "esoteric publications" in AZ. Some words translated to Scandinavian in ( ). 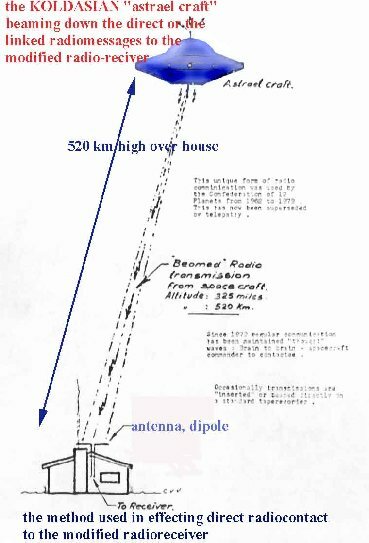 the ship may be shaded when such communications through "beams" are used and the ship is normally much higher - as in the KOLDAS case - 520km above the house!! There is nothing unusual about a man having a conversation with his wife but when that man suddenly becomes a stranger it can create a tense situation. It was so on October 1, 1966 in Phoenix, Arizona when a young man remarked that his vision seemed to have been affected. It was as though the room had become a color photo negative. Light and dark areas were reversed, as were the colors. In examining the occurrence the man closed his eyes. His wife waited quietly as he appeared to relax. Suddenly his eyes opened wide in a penetrating, unblinking stare. Her reaction was intently observed. Shaken by the unfamiliar expression she inquired, "What's wrong with you?" A strange voice spoke from the man she had married more than twenty years before. "I am Ishcomar," was the reply. The effect on the woman was visible as she asked, "Who is Ishcomar?" A lengthy discussion followed. Upon completion of the message, the stranger departed and the man awoke with an apology. "Must have dropped off to sleep." "Must have had a dilly of a dream too," was the relieved response as the familiar tones of the voice she had known for many years indicated the man was again in control of his body. "Why, what happened?" he responded. The man sat open-mouthed as his wife related the details of the previous hour. Only the passage of time, as indicated by the clock, and the faith that his wife would not be so serious if it was a joke made the story believable to the man. The rest of the night was utilized by the man in questioning his wife about the unfamiliar experience. The decision was made to try again the next evening and to have a tape recorder handy in the event that "Ishcomar" would again speak. There was little to be disappointed about as Ishcomar did speak, and has continued to respond each time he has been reached for by the mind of the man he uses to convey his messages. The communication is established by what Ishcomar has described as a "tensor-vector beam." This beam is under the control of those on board the craft he describes. The first recordings were difficult to understand due to a very heavy hum that appeared on every tape. In all tests the tape and recorder functioned normally. Ishcomar advised the magnetic properties of the tape were being affected by their beam and adjustments would be made to correct the condition. This was done and the recordings now come through loud and clear. The contents of the first message and some of those that followed are reproduced on the following pages. Years of effort have been unable to prove - or disprove - the identity claimed by Ishcomar. As Ishcomar says, "acceptance is by your own choice." "I bring you greetings from beyond the stars. It is requested at this time to bring to you a communication of our intent for the inhabitants of your planet. I will explain to you briefly who we are and who and what I am. "You have named some of our craft who move through your atmosphere 'flying saucers'. I am not recorded in one of these. The craft that contains the instrument in which I am recorded is four and three-tenths miles in length(6,9km), by your methods of measurements, and two and one-tenth miles in circumference (ca.3,4km i diameter? enda ordet vel betyr omkrets). "This craft also contains others of us who are in human form. I have passed the phase of human form. My knowledge and mind processes were long ago recorded into an instrument you would liken to a computer. "I was brought to the vicinity (nabolag) of this planet approximately thirty thousand years ago, by your method of time measurement. Your planet and the living forms upon it have a specific value to us. "Our intent, however, is not to control or to rule over you. Intergalactic law within our group forbids this. We are, however, permitted to guide you. Your acceptance of us is by your own choice. "Our vessels number somewhat over twenty thousand (in 1966) in use within the confines of your solar system. These craft vary from a few feet to many miles in length and circumference. These craft vary in shape and size dependent upon the purpose for which it is used. "Our human forms number many thousands. Some of them were alive in their present form before I was brought here. Those in human form inhabiting our craft have ceased to repropogate. This condition makes it necessary to choose one of two courses when it becomes necessary to dispose of the human vessel; whether to be recorded in a device and stored, as I was, or to be recorded into another suitable form. 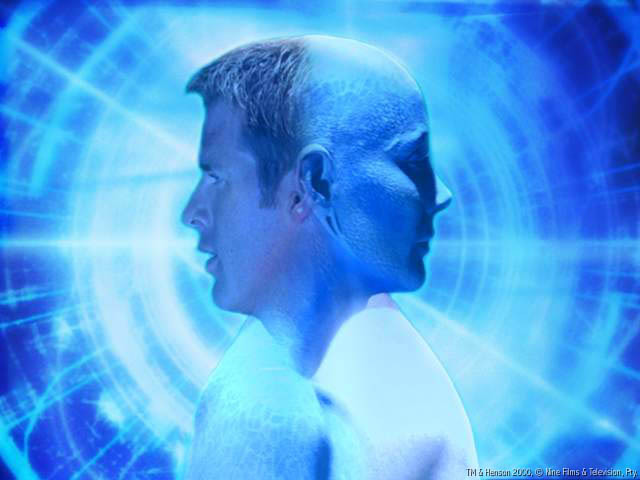 "We have been unable to manufacture, by synthetic means, suitable human type forms. This, therefore, makes it necessary to find planets young enough where new man beings are being born, yet old enough for the human form to be developed to a point that will provide suitable bodies with sufficient brain capacity to receive our knowledge. "By mutual agreement between a planetary dweller and an inhabitant of our craft, the knowledge and memory of one of us may be blended with the planetary inhabitant without the loss of the receiver's identity. The one from our group only adds his knowledge to the planetary dweller, and the abandoned body is disseminated. "This blending may not take place without mutual agreement between the beings involved, and necessarily the planetary dweller must fully agree and desire this blending. We seek, therefore, not to take but to give. "You must reach a high level of mental development and knowledge to be able to understand our purposes beyond harvesting (bak innhøstingen). We have attempted to gain your cooperation in this for thousands of years. We have been vigorously (kraftig) opposed by the other group. We must achieve our goal by guidance of your kind, but you must desire guidance for us to be of assistance to you. "Our work is beyond your present level of understanding and yet you will eventually be of great assistance in cooperating with us - in making certain studies of life forms and conditions on your planet, the result of which will be compared with intercorrelated (samsvarende-) studies being conducted on other worlds, to the benefit of your own planet, our people, and the inhabitants of these other worlds. "We have worked patiently with you for over thirty thousand years. However, the development brought about would have taken, by normal cycles, over two hundred and fifty thousand years. "We also have limitations making it necessary to adhere (overholde) to certain conditions difficult for you, at this time, to rationalize. "Our intent and purpose toward you exceeds your most beautiful wishes and dreams for your existence. The inhabitants of your world have been repeatedly told of this and it has always been converted to spiritualistic ideals. "It is understandable thought process to attempt to understand the unknown by measuring it with the known. We do not condemn for this. To those of you who will follow certain steps, we may be able to help you a great deal to reach higher understanding, thereby improving your own conditions of survival on your world, and at the same time assist us in our endeavors. "The man whose body and mind I am using to speak to you - is being used by his own full cooperation. Had he not reached out, I would not have been beamed to him in answer; yet all who reach, however, are not answered - for all do not reach out in honesty of purpose. Some wish to acquire some personal gratification (tilfredsstillelse) of the moment, and therefore do not reach a point of open acceptance - necessary to receive me. I am beamed to many on your world. This man is not spectacular therefore. "We are using many methods at this time to inform your people of our presence and our immediate purposes. The time is quite near for cooperation between us to begin (remember time is relative - they have been here for thousands of years -R.Ø.'s.). Your next step upward will soon begin. "Full knowledge of our presence will soon be known among your people. There will be, at that time, great upheavals on your planet. We regret (beklager) this cannot in any way be avoided. We knew this from the beginning. We, therefore, have repeatedly warned to prepare for it mentally and physically. Those who take not the trouble to prepare are of little value to themselves in any case. "We can in no way tell you the day or the minute this upheaval will begin to take on climactic proportions. You must watch and prepare yourselves according to the conditions you observe. We will guide those of you who sincerely allow us to. "We do not intend any evacuation of your planet on any scale. You are of no value to us in the outer reaches. Our craft are now adequately manned. "Our need of your cooperation involves habitation of your world by your own people, under more suitable conditions than you now realize, however. "Following the climactic upheavals on your world, we will provide guidance to bring about the desired conditions for your, and our, mutual benefit. "Seek us and you will find us. "We only await your call. "I make the request that you examine carefully what I now speak to you, for I speak to you of the sovereignty of your world. "The man beings upon your planet are engaged in turmoil to decide which grouping of man beings should own your planet. Many of you, who are aware of us, call to us to help you slay and destroy those whom you believe to be your enemies. "Those who do so do not understand that among the ones that they call their enemies are man beings who are also aware of us, and request the same task of us. Are we then to accept these calls and destroy all of you? "The inhabitants of your world have always searched beyond themselves for others to solve their problems for them, individually and as groups, large and small. You refuse to accept the fact that your world belongs to all the man beings that inhabit your planet, equally, yet combined as one mind complete and sovereign to yourselves. "There can be no ultimate solution to your problems as an individual being or as a sovereign world until you have eliminated the barriers you have placed between yourselves, in all their complex forms. "Each of you singly is a sovereign being and could be likened to a universe, complete unto yourselves. You co-inhabit your world with other beings who are equally sovereign to themselves in the same way. "There is no question of right to this state of existence. It is the ultimate fact. Not one of you, or of us, have the right or power to own a sovereign being. To trespass (krenkelse) upon that sovereignty in any action is a most serious action of existence. "The complexities you have created for yourselves through lack of knowledge of this first principal of existence has wreaked untellable havoc on your world. Each of you must seek within your thought structure, that you have assembled since birth by your experiences and evaluations, and apply this first principal of being, then proceed to provide this catalyst to all who will listen to you. "When all man beings who inhabit your world have not only heard this, but accepted it, you will no longer have need to control yourselves by complexities of conflicting rules and laws, nor will you need to waste the lifetimes of so many of you in enforcing them. "The combined goal of all man beings on your world should have but one end result toward which to expend all effort. Care for your planet. Preserve it and improve it by balancing its imbalances, and garden it for it is your home. It is necessary for your place of habitat. "You now are more and more rapidly destroying its capability of sustaining your physical existence through non-recognition of the sovereignty of individuality of each inhabitant. Each inhabitant, in his own way, is contributing to that destruction. "You have ten basic rules in one of your religions. To disregard any one of them is to ignore the basic sovereignty of another man being and the world mind, which is your sum total. I give you this only as an example, not the total solution. "There is no place to hide. You, yourself, are responsible to your world as a whole - for your every thought and action. Every thought or action that disregards your responsibility to the well-being of the co-inhabitants of your world, constitutes an irreversible seed of destruction -that ultimately grows to add its branch to the tree that now blights (visner) your world. Only the combined total of the beings who inhabit your world, may bring into bloom the tree of life. "What you describe as imagination is the creative part of your being. Study it, come to understand it, then strive to discontinue using it improperly for negative purposes. Instead use your creative structure to create for beneficial purposes for all. "If you write only one word that improves one moment, it is far better than to disintegrate an entire mountain for no useful purpose. We will assist none of you to destroy. We will assist you to gain the principals by which to build. "The so-called incurable diseases on your world are a direct result of environmental reaction through lack of knowledge of the status of life processes within your solar system environment. "You have allowed elemental changes that occur second by second to dictate the conditions of your existence, rather than exercise control over environment through knowledge and self-discipline. "All diseases on your world, with the exception of diseases in the very young and other obvious exceptions, are self allowed, not self imposed. "By coming to understand the mechanics, not the customs, underlying the reaction through what you recognize as prayer, you will open doors of understanding concerning your intellectual controlling influence -through the use of thought power exerted (anstrengelse) on the interchange of elemental forces in which you have your existence.